If China’s Economy Crashes, Will the Film Business Crash With It? There has been a great deal of global hand-wringing in recent weeks about China’s economy, and a growing consensus that it’s headed for trouble. Several of the country’s leading economic indicators have dipped, and home sales and stock market indices have been dropping for weeks. What does all this mean for China’s booming film industry? If the economy crumbles will it take the movie business down too? China is vastly under-screened. 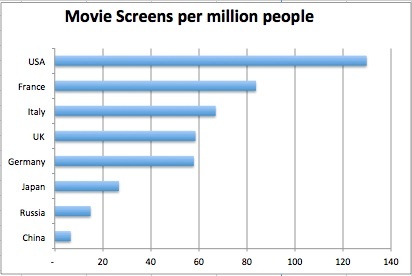 Whereas the U.S. has a movie screen for every 7,700 people, China has one for every 150,000. Over 2,000 counties and numerous cities of 1 million and more people have no movie theaters at all. There is enormous pent-up demand for the movie-going experience that’s unlikely to diminish much even in a recession. Cinema construction is on a tear, with total movie screens having nearly doubled in two years, from about 4,700 in 2009 to an estimated 8,900 now. 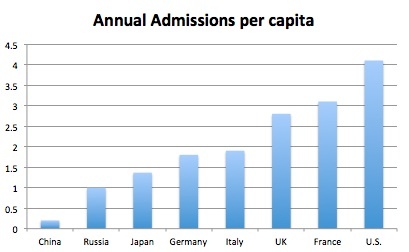 And the screen count is likely to double again in the next 3-4 years, because owning and operating theaters in China is extremely profitable. While only about a quarter of China’s population has sufficient income to regularly afford movie tickets, that’s still almost 350 million people, more than the entire U.S. and Canadian populations combined. And that number will continue to grow, recession or not. Cinema-going is only beginning to be established as a habit in China. Even after the tremendous expansion of incomes and increased accessibility of cinemas over the past decade, the average Chinese person still goes to the theater only once every five years, and spends on average just $1.00 per year on movie tickets. 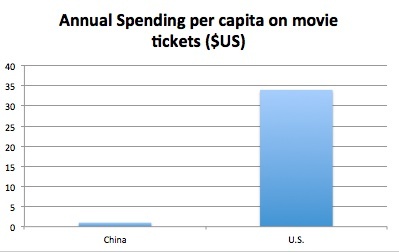 Compare this with the U.S., where the average person attends 4.1 movies each year and spends $34 on tickets. China has a long, long way to go before it will face the challenges of market saturation and growth constraints that plague more developed markets like the U.S. Box office revenue in China has grown four times faster than the country’s GDP for 10 years now, even through the fiscal crisis of 2008. An economic slowdown would, at most, slow the pace of box office growth from torrid to merely very fast. Even in the highly unlikely event that per capita incomes drop for an extended period, Chinese theater operators enjoy great latitude–much greater than operators in the U.S. and other mature markets have–to adjust ticket prices to accommodate moviegoers’ needs. Ticket prices in China are extremely high relative to average incomes, perhaps the priciest in the world on a relative affordability basis. And there’s plenty of room for theater operators to negotiate with their landlords to reduce costs: many theaters are currently forced to pay as much as 20 percent of their revenues to the real estate owners, which is 3 to 4 times more than they paid only 3 years ago. Vast pools of capital have been allocated to funding movies. China made 526 films last year and imported around 50 more, but only had room in its theaters for about 150. Even if production were to suddenly plummet, which is extremely unlikely given all the available funds, there would still be more than enough films to supply distributors. The central government has made large and very public investments in the film industry, in the form of major new production facilities, production and post production equipment, distribution infrastructure, and staff. Furthermore, they recently designated ‘cultural’ industries—especially film—as a major priority for growth over the next 5 years, partly as an engine for economic expansion and partly to extend China’s ‘soft power’ around the globe. In short, China’s movie business is still in its infancy. Movie going has swiftly become a favored pastime, and it will only become increasingly accessible and affordable for hundreds of millions of people. Whether it happens now or in the future, a slowdown in China’s hot economy is inevitable, but cinema isn’t going away any time soon. This entry was posted in Analysis and tagged average annual attendance, China moviegoing, China's cinemas, movie ticket prices in China, per capita spending on movies, Rob Cain, screen count by chinafilmbiz. Bookmark the permalink. Nice job Rob. Very insightful analysis. Excellent. The graphic information is well chosen. A very clean argument. Great stuff! Steven, many thanks for your kind feedback!